Greetings! Hope you enjoyed the spring and summer like weather that we have been getting recently. 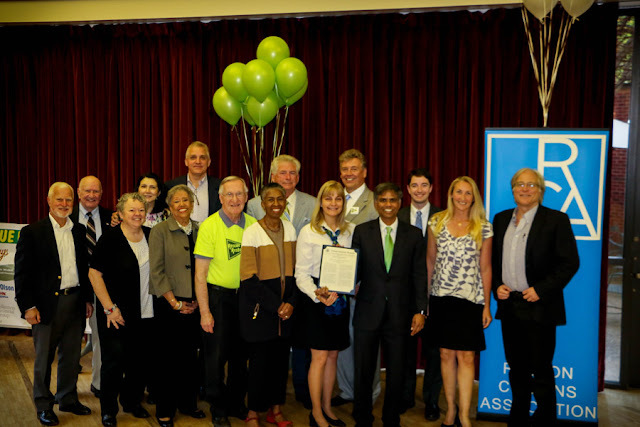 On Sunday, April 24, 2016, Reston Citizens Association (RCA) was proud to present the 2015 Citizen(s) of the Year award to a very deserving recipient – Rescue Reston (RR) organization and its 6000+ supporters. The award was presented at a ceremony held at Reston Community Center, Hunters Woods in front of over 100 attendees, including the Hunter Mill District Supervisor, Cathy Hudgins, Virginia State Delegate Ken Plum, Fairfax Federation of Citizens Association President, Tim Thompson, Reston Association (RA) President, Ellen Graves, RCA as well as RR Board of Directors and a variety of community leaders, past honorees Cate Fulkerson, CEO, RA, Kathy Kaplan, Marion Stillson and John McCrea, who nominated Rescue Reston for the award. After my opening remarks, Mr. McCrea, long-time Reston golf course resident and President of Reston firm Achieve-it, LLC, described why he nominated Rescue Reston. He was followed by Ms. Hudgins; Mr. Plum; Alex Robbins, Fairfax Outreach Representative for Congressman Gerry Connolly, Mr. Thompson, and Ms. Graves. I presented the award to RR board members - Lisa White, Robin Hogan, Ray Wedell, John Pinkman, a co-founder of RR, and Connie Hartke, President – who also invited the audience to join in on this honor. Mr. Pinkman and Ms. Hartke made acceptance speeches. Reston Connection newspaper has reported extensively on the event and it can be read here - "Thousands Become Citizen of the Year." From my perspective, while there was much to celebrate in how the community came together as one voice to preserve the golf course as open green space, what struck me was the excellent collaboration between all the different local and County organizations involved (the County, RA, RCA and RR). The golf course fight represents a great example of what can be accomplished by working together. Since 1976, RCA has named a Restonian as Citizen of the Year. The Citizen of the Year event is our signature public event of the year, when we take the time to celebrate the citizens who have contributed to Reston above and beyond what was expected of them. Through this award, we spotlight the work of dedicated citizen volunteers and civic activists who work tirelessly behind the scenes. They are the heroes who have made Reston what it is and represent the best of Reston’s values. We called for nominations from the public early February 2016 and received names of several very qualified nominees, thus making it a difficult choice as it always is. The Citizen of the Year Committee of our Board then went through a process, following which the RCA Board picked the Citizen of the Year. This was done after we weighed a variety of factors – among others, whether the awardee’s efforts had enhanced the quality of life in Reston and whether they were consistent with Reston’s planning principles, vision and RCA’s goals. And we looked at outcomes as well. This year’s citizen of the year was different in one way - we chose a unique recipient – Rescue Reston and its supporters, the first time we have chosen a group of citizens and an organization. Rescue Reston was founded in August 2012 specifically to challenge a potential proposal to have Reston’s only public golf course rezoned for residential development. It started with three people, who mobilized hundreds of activists and it is now a 6,000-member strong organization. Its supporters were galvanized to fight an appeals process in front of the Fairfax County Board of Zoning Appeals (BZA) initially. Then the organization and support base expanded and strengthened as a legal process unfolded. Fairfax County, Supervisor Hudgins, RA and Recue Reston were great partners in the fight, with Rescue Reston leading the charge from a public perspective. · Hundreds of people attended rallies, a variety of local organizations joined the fight including environmental groups. · Thousands contributed funds to support legal costs as the process wound through the courts. · Over 500 people showed up to show support and comment at the BZA meeting in which Fairfax County, RA and RR attorneys presented evidence that the golf course land use designation is permanent open green space. · Critically, Rescue Reston researched and found incontrovertible historical documents that supported the open green space designation for the golf course. The Rescue Reston website (http://rescuereston.org) and press reports detail the chronology of events and what transpired, but as things stand the coordinated efforts resulted in the Fairfax County Circuit Court requiring the golf course owners to file a plan with the Fairfax County for any proposed redevelopment. They must follow the same County process for a land use change as any other landowner. The golf course owners, RN Golf Management, have decided not to pursue an appeal to the Virginia Supreme Court against the Circuit Court ruling. This outcome was a great result and many thanks from RCA to Rescue Reston members and leadership for uniting thousands of citizens and many of the leading organizations, and fighting on our behalf for a great public common good for the Reston community. We anticipated a well-attended event last Sunday and we were not disappointed. Any event like this one cannot be held without the support of a lot of people. The JBG Companies, the property developer that is expanding Reston Heights “in a location” that we would want a developer to build (north of Sunrise Valley Drive, opposite the golf course as opposed to on it, J) was a significant contributor. Local companies that supported us also include National Realty, a premier Northern Virginia real estate agency, and Bleevit Interactive, a company that provides web-design, search-engine optimization and social media services. Area grocery chains also supported the event strongly – Wegman’s of Fairfax, Harris Teeter and Safeway of Reston. And not least of all, many thanks for direct donations from the public as well as from directors of RCA and RR to help make this event possible. A lot of people worked long days and hours to make this happen. My thanks to RCA’s Citizen of the Year Committee – Hank Schonzeit, Geoff Lewis, Lynne Mulston and especially the Chair, John Hanley, but for whose tireless work from January of this year, we would have been hard pressed to have gone through the process and ultimately actually host an event. I am grateful to Jacqueline Carr Photography for great pictures (view here) and South Lakes High School students Madison Evans, Kathryn Becker, Lindsey Daniels, and Kahlil Dover for their cheerful and enthusiastic help. Finally, of course, thank you to the members of the public and all the community leaders for attending and making it a memorable and successful event. I look forward to another fantastic event next year and RCA honoring another great citizen or who knows – another great organization!! !